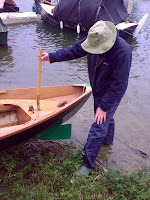 The late, great and very much lamented Phil Bolger had fixed views about adapting rowing boats to sail, and vice versa. Discussing the rationale behind his Sweet Pea design, he wrote in Boats with an Open Mind: "Aside from getting the proportions just so, the hard problem was to give the boat lateral plane and a rudder without totally spoiling it for rowing, as uaually happens if you yield to the pervasive impulse to rig a nice rowing boat to sail (fitting a good sailboat with oars is usually more profitable)." 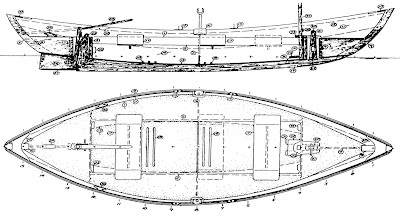 Bolger's solution to the problem was to design a slipping keel and inboard rudder that could be removed when rowing. 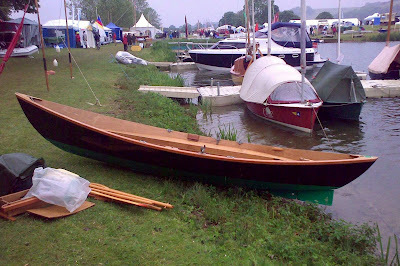 A friend of his built one and kept it on Bolger's pontoon but apparently never made the keel because it was never sailed. So it was great to meet Paul Apps with his own Sweet Pea at Beale Park, to find out how Bolger's slipping keel and rudder work in practice. Paul leaves the keel and rudder in place all the time because it helps the boat track straight - apparently she slides all over the place without them. When rowing the rudder is held straight by reversing the tiller so the end falls into a slot in the sternpost, a feature that mightily amused Dynamite Payson, apparently. The picture shows Paul's hat demonstrating it. Paul reports that the rudder is effective and under the small spritsail she goes about nicely most times: if she stops in irons it is simply a matter of getting an oar out and giving a helpful nudge or two. Pointing is not particularly good but she was as fast as anything else on the Beale Park lake, Paul found. But he still rows more than he sails, although this is partly because he lives near rivers rather than lakes. An unexpected advantage of the slipping keel and removable rudder is that when they are removed the boat sits nicely on its trailer. 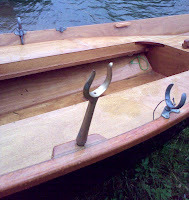 The boat is beautifully made and is even equipped with Bolger's favourite long bronze crutches, even though they cost a fortune to import from the US.